Electric stacker is best used with pallet racking. This combination will give you are floor space multiplier easily. Do note that you’ll require open based pallets to use electric stackers because under the forks that lift the pallets, there are too more “legs” called the straddle to help the stacker stand while lifting your pallets. Read below for more information on open based pallets. If your goods are not stacked already stacked on open based pallets you might want to consider getting reach trucks so that you can lift the pallet as it is. Unsure of what to get? Feel free to email us so that we can guide you along the way. With the rising cost of warehousing costs, many warehouse owners have already doubled their usable storage space by stacking pallets on top of one another using pallet stackers. If your goods are palletised in such a manner that you can use a pallet stacker to stack your goods up you should. If it’s not possible to stack pallets on top of one another and you are running out of space, you should most probably consider getting a pallet rack as well. Can I use an electric stacker with all my existing pallets? 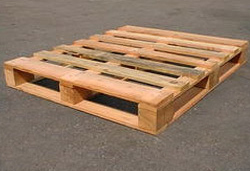 Firstly you need to take a look at the bottom of your pallets. 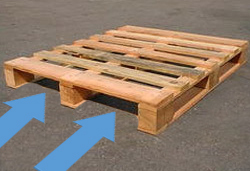 If you have closed based pallets like the one shown below with horizontal wood pieces running at the bottom, you will need another type version with a wide straddle. The pallet stacker can enter the pallet and lift an open pallet up with no problems. 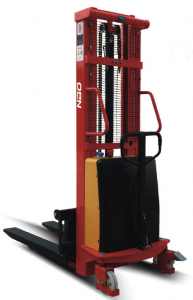 Electric Stacker Capacity – what do that mean? 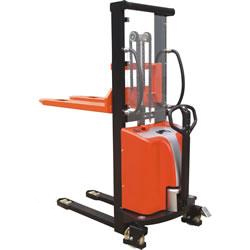 Electric stackers come in various capacities like 1T/2M (Max of 1000kg, Max of 2M height). What it means is the ability to carry 1000kg off the floor to a reasonable height like 30cm. Any further up, the electric stacker will have reduced lifting capacity due to the extension of the mast. 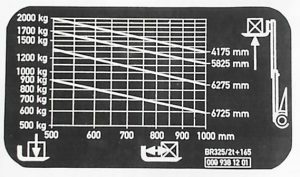 So, do not expect to carry 1000kg of load up to 2m as stated on the factory’s specification of 1T/2M. Instead, what it means is your electric stacker can carry a maximum of 1T off the floor. 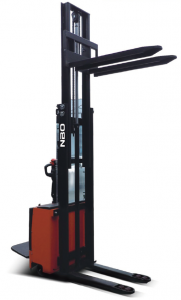 At 2M you can safely expect that the stacker can carry about 400 to 500kg of cargo. There will be a similar chart like the one below on the electric stacker to help you determine the max load when using your electric stacker. Do we have manual hand pallet stackers? Yes, we do carry manual hand pallet stackers on request as well but it isn’t something we promote because of safety concerns. Raising a pallet stacker is very similar to raising a pallet jack. You have to pump the handle in an up-down fashion to raise the pallets, each pump raising the pallet by only a few mm. When you have to do this for several pallets, the operator gets worn out and tired. As a result, safety is compromised because fatigue sets into the operator. In contrast, an electric pallet jack works by flicking a switch on the handle to lift the loads. This is a lot easier compared to the pumping action of a manual pallet stacker. Both models will raise and lower the pallet by push of the button. However, the full electric version allows you to glide the pallet stacker along the floor easily because it is powered by an electric motor. So, for the semi-electric model, you will have to pull it along the floor using good old traditional hand power. Questions about electric stackers? Feel free to drop us an email and we’ll get back to you soon!